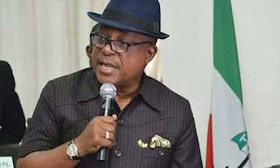 National Chairman of the Peoples Democratic Party (PDP), Prince Uche Secondus yesterday denied collecting N250million out of the $2.1billion arms cash allegedly squandered by the Office of National Security Adviser (ONSA). He challenged the Federal Government to publish the voucher(s) which he allegedly signed to collect the purported arms cash. But he was silent on alleged 54 vehicles purportedly bought for him from the proceeds of Strategic Alliance Agreement between Atlantic Energy Drilling Concept Nigeria Limited and the Nigeria Petroleum Development Company (NPDC). Secondus, who bared his mind in a statement through his Special Adviser on Media, Mr. Ike Abonyi, said the Federal Government and the ruling All Progressives Congress (APC) were desperate to frame him up. The statement said: “The attention of the media office of the National Chairman of the Peoples Democratic Party, PDP, Prince Uche Secondus has been drawn to the desperation of the Federal Government and its ruling, All Progressives Congress (APC) to frame him up with some blatant fabrications ostensibly to distract him from carrying out his responsibility of rebuilding his party. ”The National Chairman would ordinarily not want to join issues with the government on a matter already in court but noted regrettably that the administration has great contempt for the court and the rule of law and has instead chosen to use blackmail and media persecution to defame and discredit their enemies. A gimmick Prince Secondus said has failed because Nigerians have come to know the antics of the drowning government. “The Federal Government and its agency in their desperation to forge documents and defame him, forgot to reconcile their lies; the Minister of Information and Culture Alh. Lai Mohammad and the EFCC couldn’t agree on the date of the purported money collection and whether it was collected by him Secondus or by a faceless fictional Chukwura that has no surname. “While they may have embarked on a wide search since 2015 for the surname of the so called aide of the National Chairman, Alhaji Mohammed claimed in his press conference on Good Friday March 29th, 2018 that Secondus collected the money on 19th of February, 2015, EFCC on their part on April 16th, 2018, eighteen days after said the money was collected on February 9th, 2015 and in another version still quoting the same EFCC claimed February 2, 2015. Secondus said he will not succumb to blackmail and intimidation on his mission to reform the PDP. He said it was sad that the Economic and Financial Crimes Commission, which was founded and nurtured by PDP administration to tackle the issue of corruption in the system, had to turn itself into a pawn in the hand of APC. The statement added: “Secondus restated his earlier declaration that nothing, not even the blackmail and intimidation lined up against the opposition by the Federal Government would be enough to stop him from carrying out the reform of his party, the PDP, as the programme is aimed at repositioning the party with a view to rescuing Nigeria from the disaster called APC administration. “Prince Secondus described as unfortunate and tragic the fact that anti-corruption agency like EFCC founded and nurtured by PDP administration to tackle the issue of corruption in the system had to turn itself into a pawn in the hand of APC administration to witch hunt and harass perceived enemies of government just to impress and keep job. He challenged the government and any agency that have anything against him that just cropped up because he is trying to rebrand his party to bring such evidence to the court and stop character assassination in the media.